Let’s see what summer has in store for us. 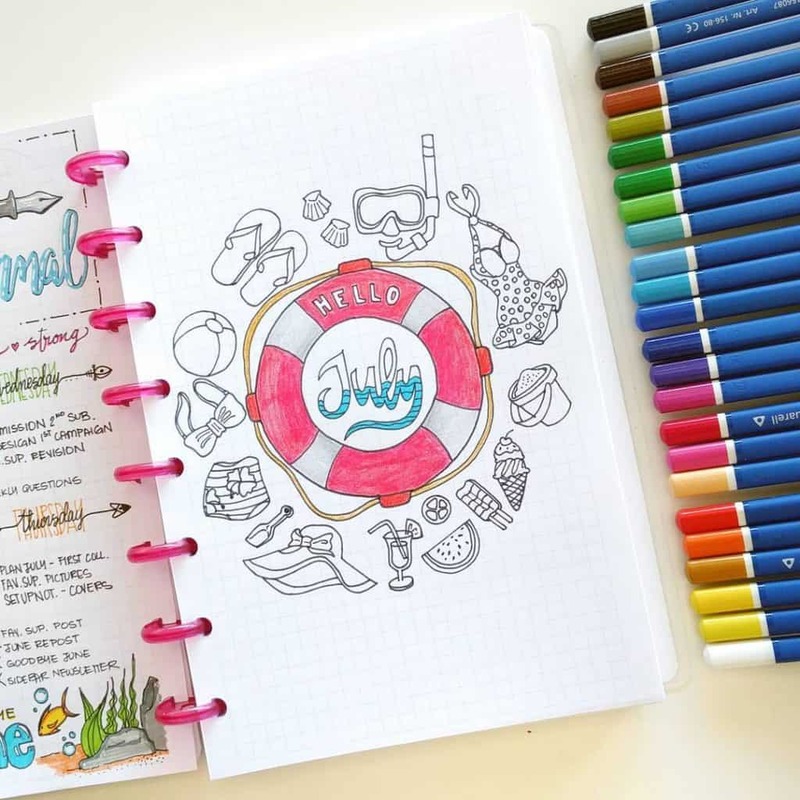 Here Nicole, has created a sea themed cover page with a life saver and lots of doodles of items you’ll find at the beach. Her instagram feed is full of beautiful doodles and even has tutorials for you to try. You should go check it out. My favourite fruit of all time is watermelon, in summer we’ll buy a whole watermelon every week. There really is nothing as refreshing as a juicy slice of watermelon on a hot summers day. 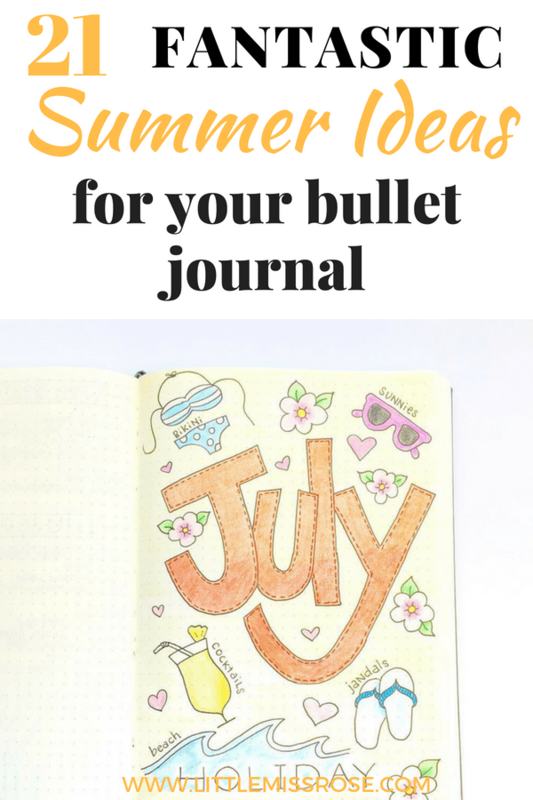 So why not add this to your bullet journal to celebrate summer, like Roz has. If you love pastel colours and beautiful hand-lettering then check out Roz’s instagram account. The use of bright citrus colours and citrus fruits always strikes me as summer time. 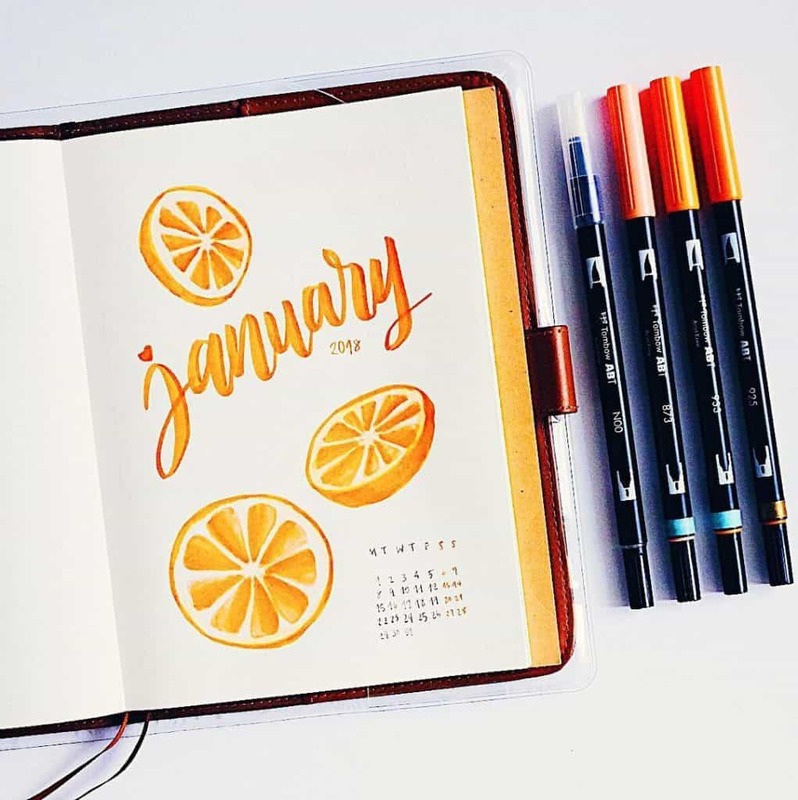 Marcela from @marcsmellows has used bright shades of orange to fill in her citrus fruits, in addtion to some simple handlettering This cover page is simple yet effective! Gemma from @doodledaydarlings has also gone with her own version of a citrus theme. She’s used bright vibrant colours which makes summer look like it’s going to be exciting and fun! Check out Gemma’s instagram account for even more fun doodles! 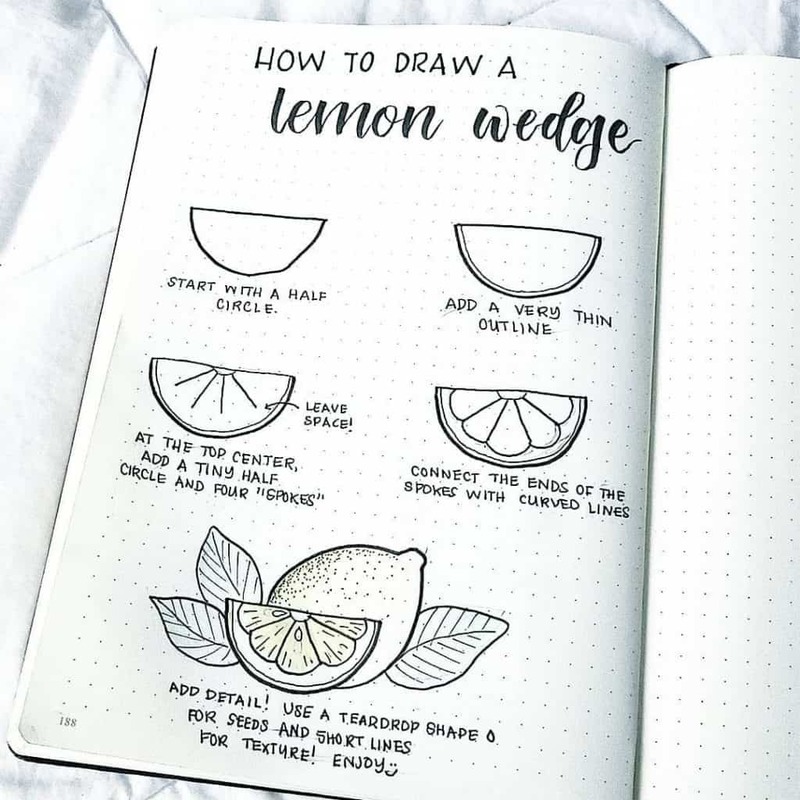 If you need some help drawing citrus fruits, Liz from @bonjournal_ has a great tutorial on how to draw a lemon wedge here. 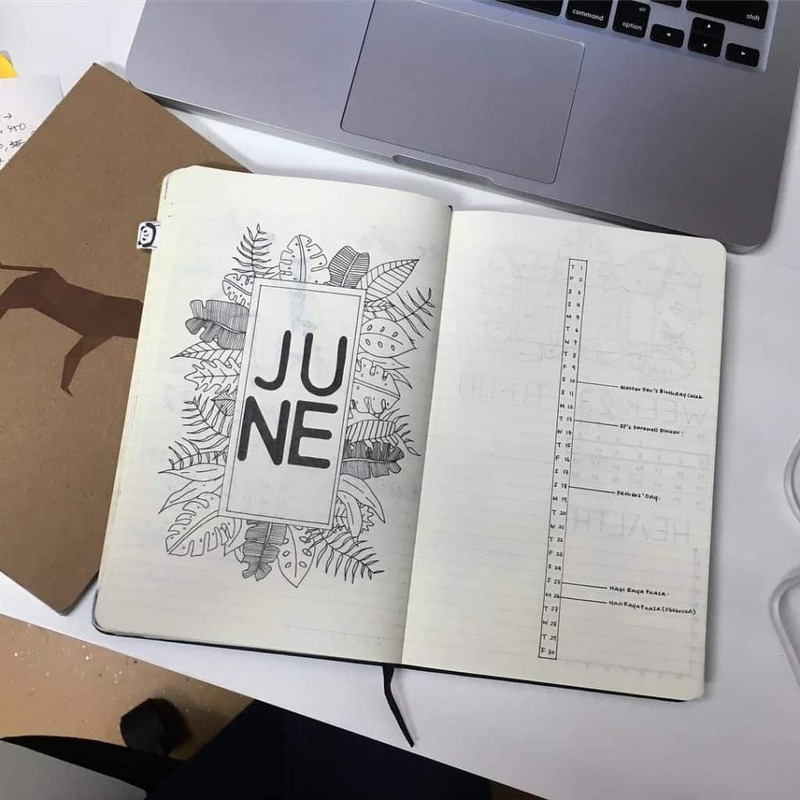 Look at this clever monthly cover page by Jess from @heartistic.jess! She’s drawn a beautiful summer scene within some simple block lettering! It’s like giving us a glimpse into what summer can be like! Heading to a tropical island for the summer holidays? Or even sneaking away at winter time…. a cover page with tropical flowers and leaves will have you in a summer frame of mind. 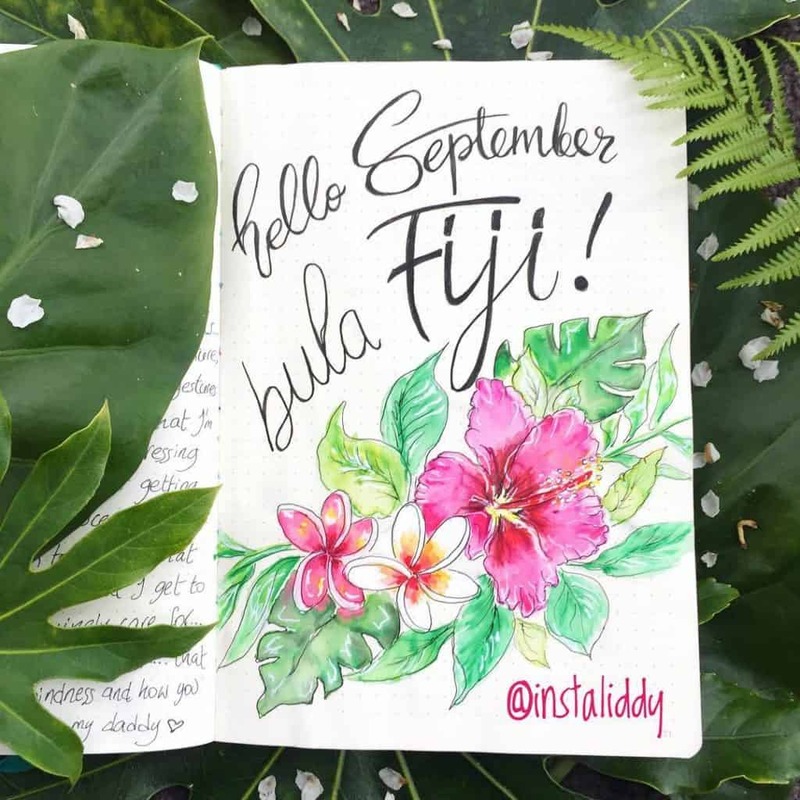 One of my favourite bullet journal Instagrammers Liddy has done an amazing job celebrating her tropical getaway. Go check her Instagram out for a peak into her “arty farty” journal. 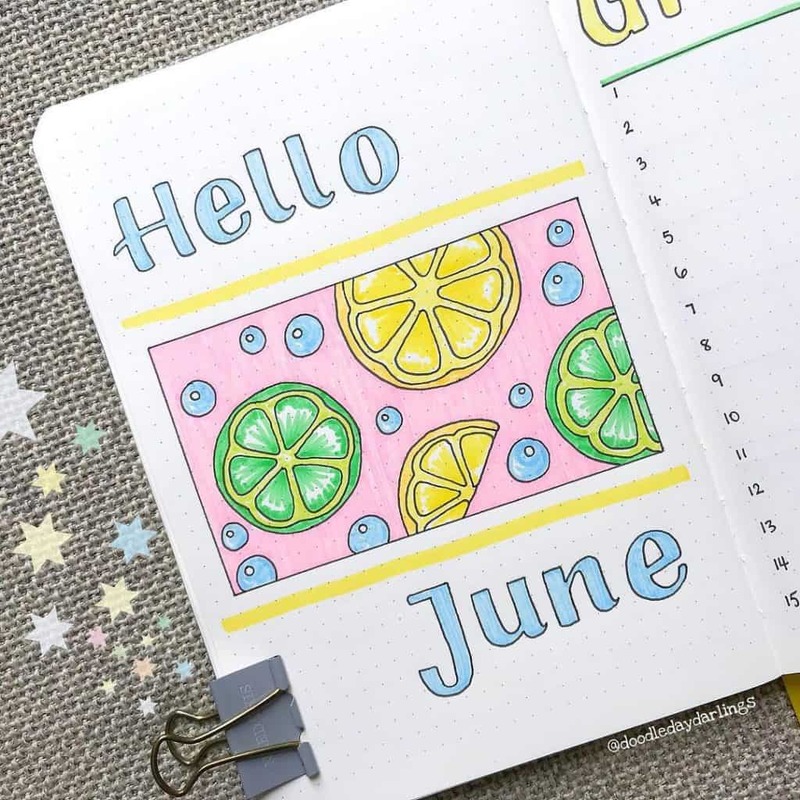 You don’t need a lot of colour, or any colour at all to have a summer themed monthly cover page. 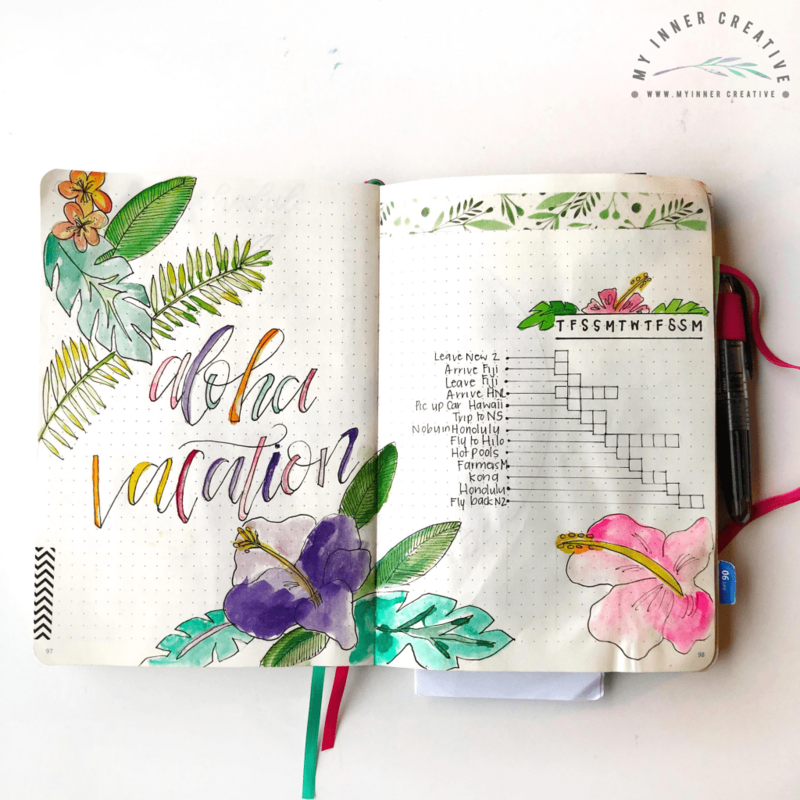 Mel from @iammel.c has created this minimal cover page using just a black pen to draw lots of tropical leaves. 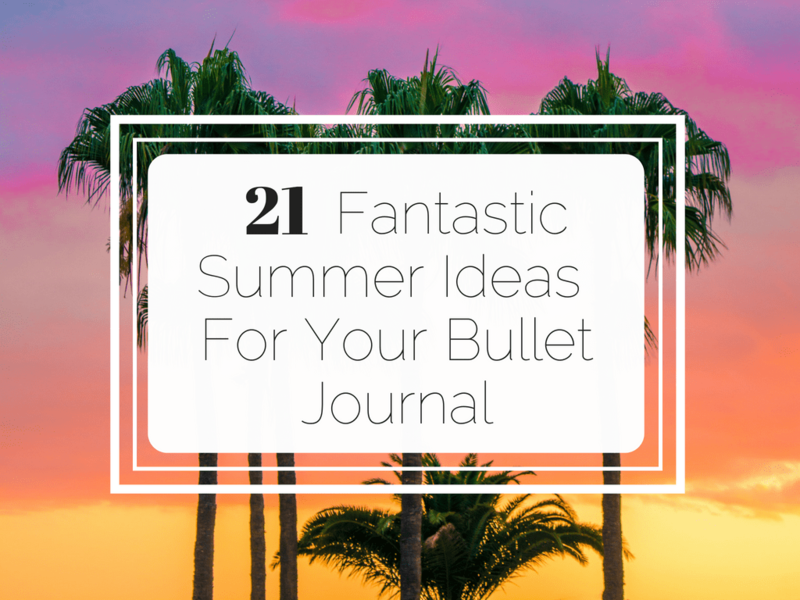 Once we get to the useful part of our bullet journals, there’s no need to stop providing the summer feels. 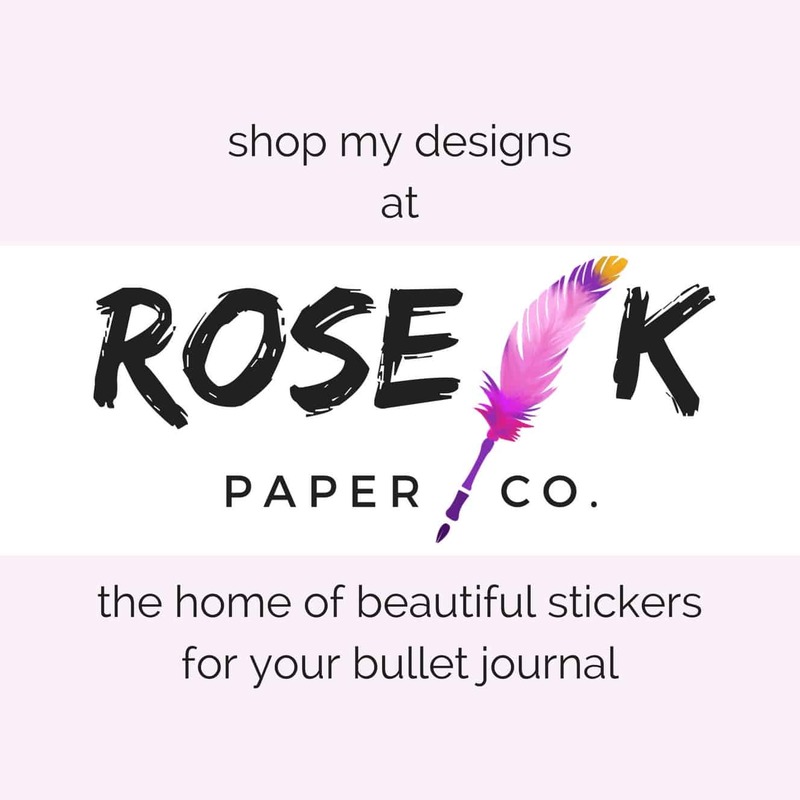 We can still create summer themed trackers for out bullet journal. These are both functional and gorgeous and still scream summertime! Wow! 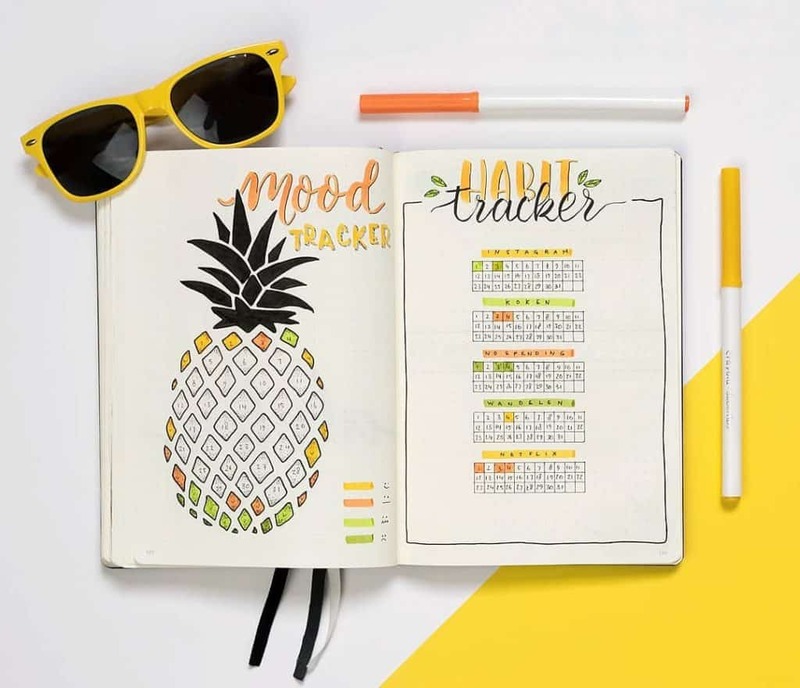 This stunning pineapple is actually a mood tracker! Pineapple is such a summery fruit and makes me think of drinking pina coladas on the beach! Go check out Manon’s instagram feed for some more gorgeous and original spreads. If you’re one of those people that like to keep a record of how many Instagram followers you have. 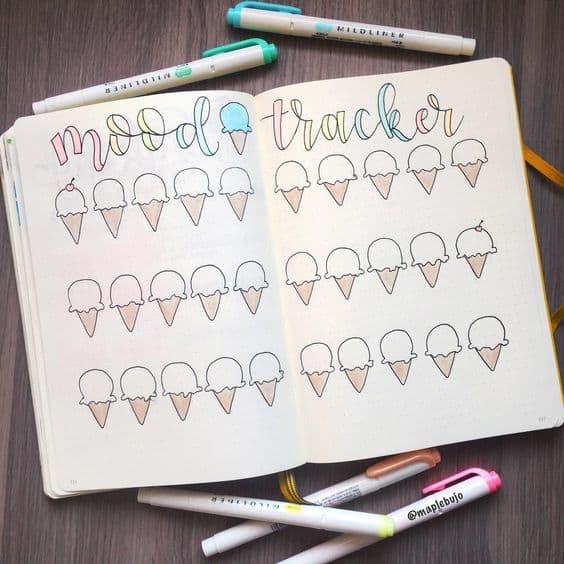 Why not try this Instagram tracker over the summer months in your bullet journal. 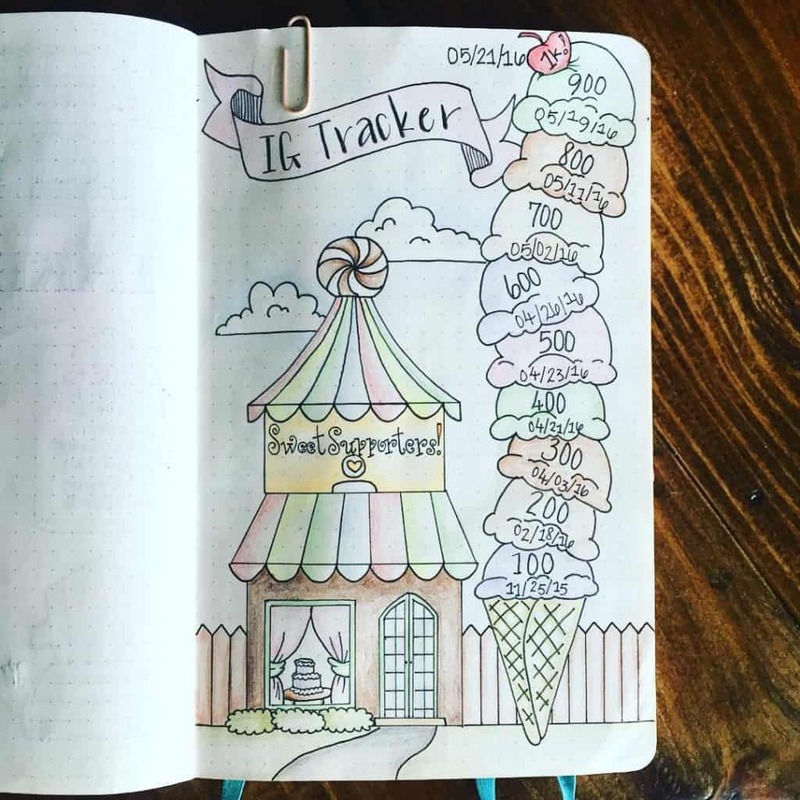 This delicious looking Instagram tracker is by Jess from @heartistic.jess again. You really need to check out her Instagram account, it is so full of lovely ideas and inspiration. Do you need to save to get to your summer holiday destination? Well this summer holiday themed savings tracker has got you sorted. This image was sourced from Pinterest here. 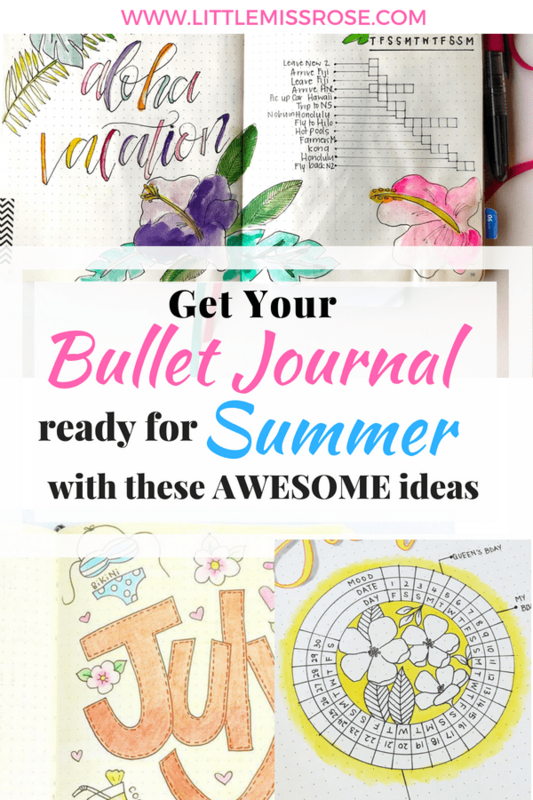 If you’re stuck on some bullet journal layouts to try for summer, whether it’s dailies or weekly spreads, or even monthly spreads, here are a few to give you some ideas. 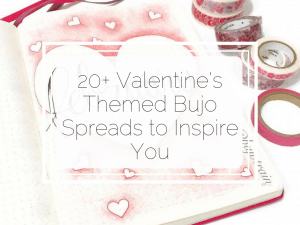 Check out this cute little weekly spread by @mylittlejournalblog. 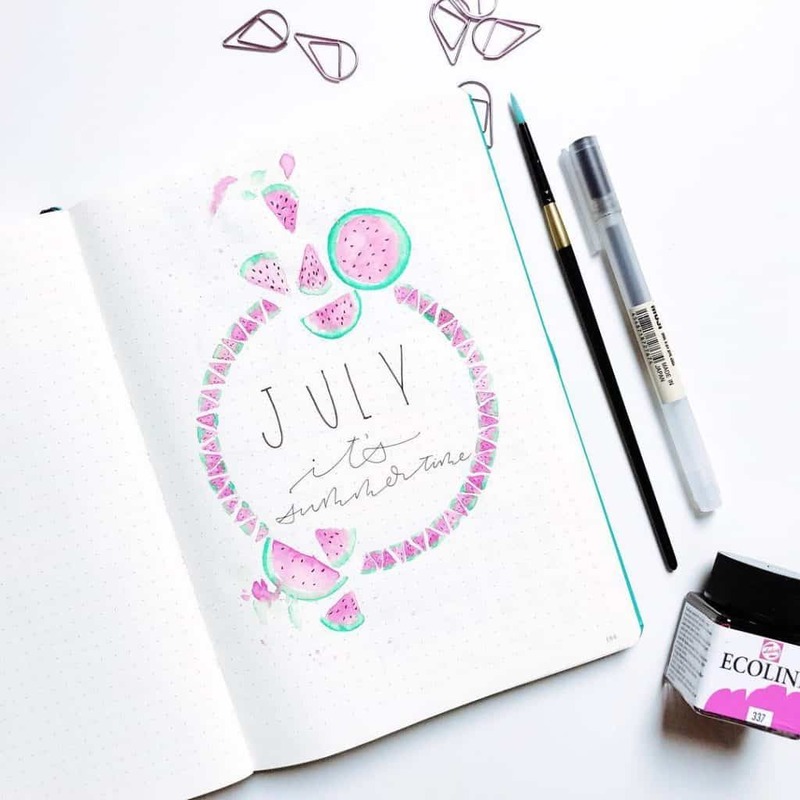 The beautiful watercolour watermelon hints at summer, while the actual layout itself is simple yet effective. If you can’t draw or doodle, don’t worry. Try adding photos from your last summer holiday to your spread. (Image found on Pinterest). Add some cute summer fruit kawaii fruit to your pages. Colour them in with bright vibrant summery colours to give your spread a happy holiday feeling. Just like @jellyfish.spreads here. 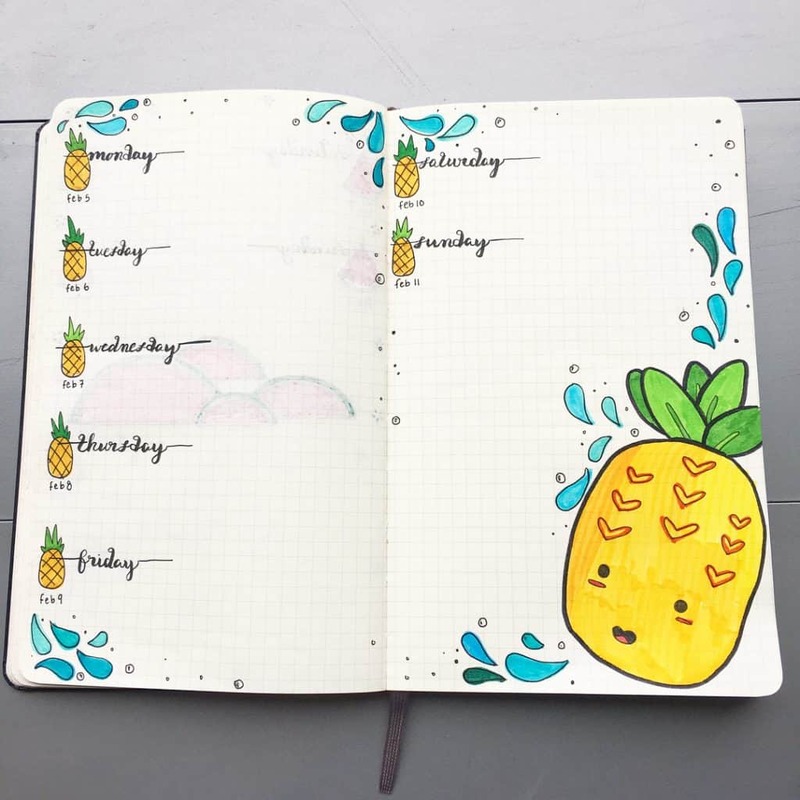 Create a tropical themed monthly spread to give your calendar a summer look like Masha from @mashaplans. 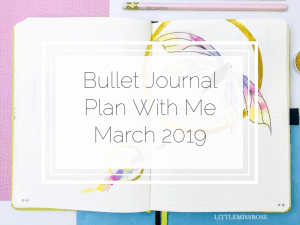 Other than your monthly log, weekly spreads and daily logs, there are other collections you can add to your bullet journal. 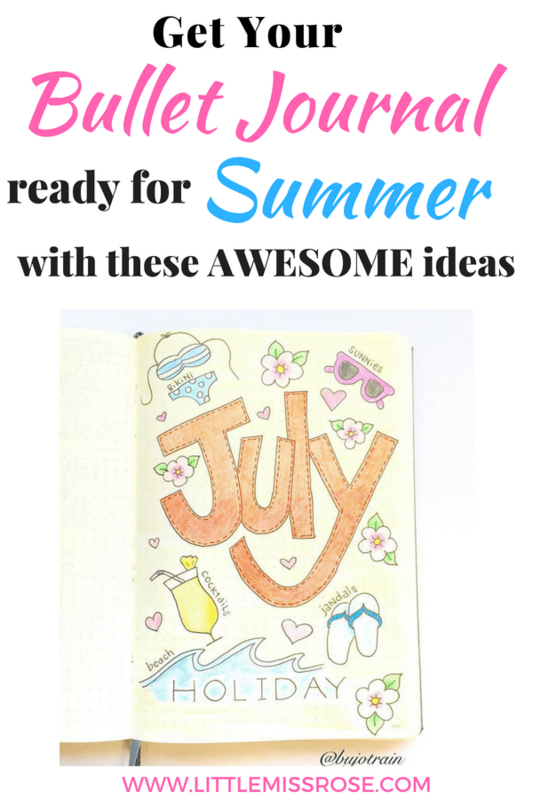 And just with everything else you can give them a summer vibe by including summer doodles or headings, bright summery colours or images and photos of summer things. 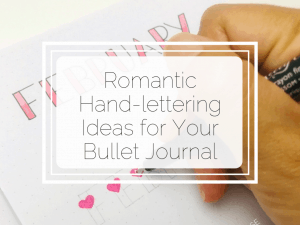 But you could also add specific summer collections to your bullet journal. 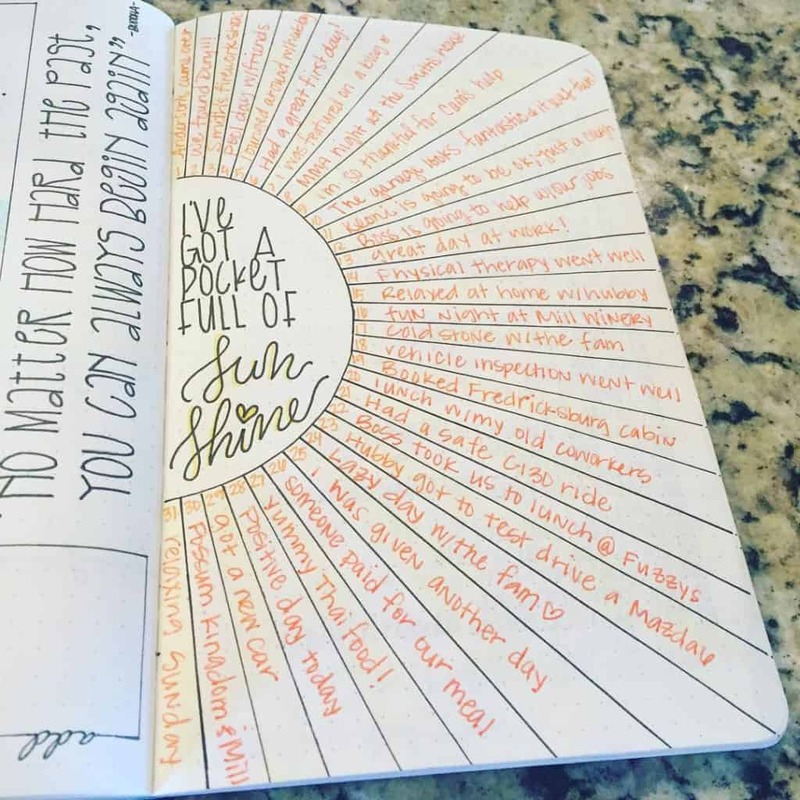 Sheena has created a small bucket list for summer as well as planned out her whole summer. 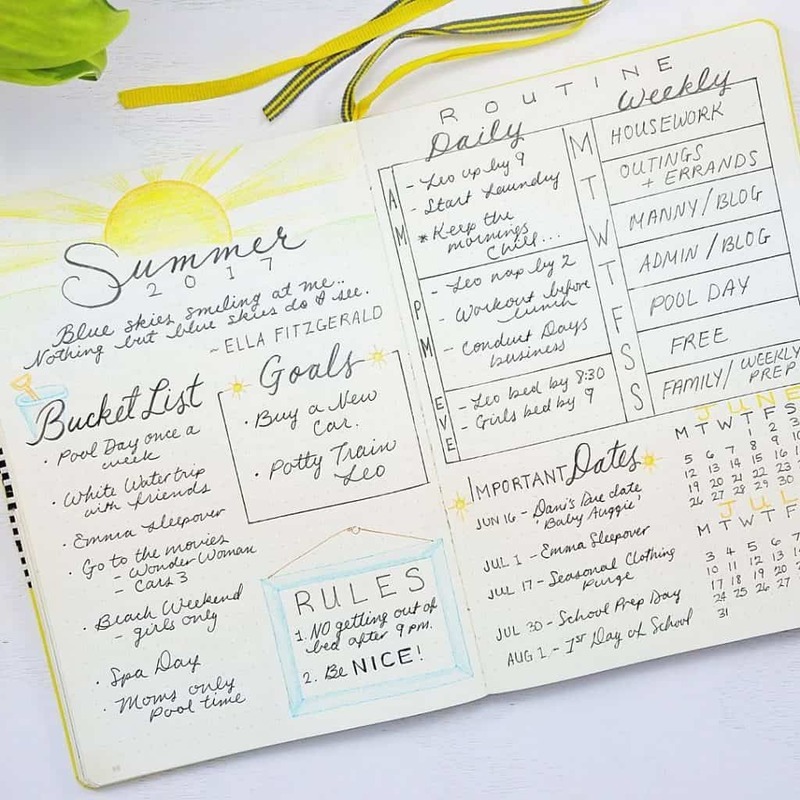 She’s even gone as far as planning her weekly and daily routines over summer. You can read more on how she’s planned her summer here at sheenaofthejournal.com. 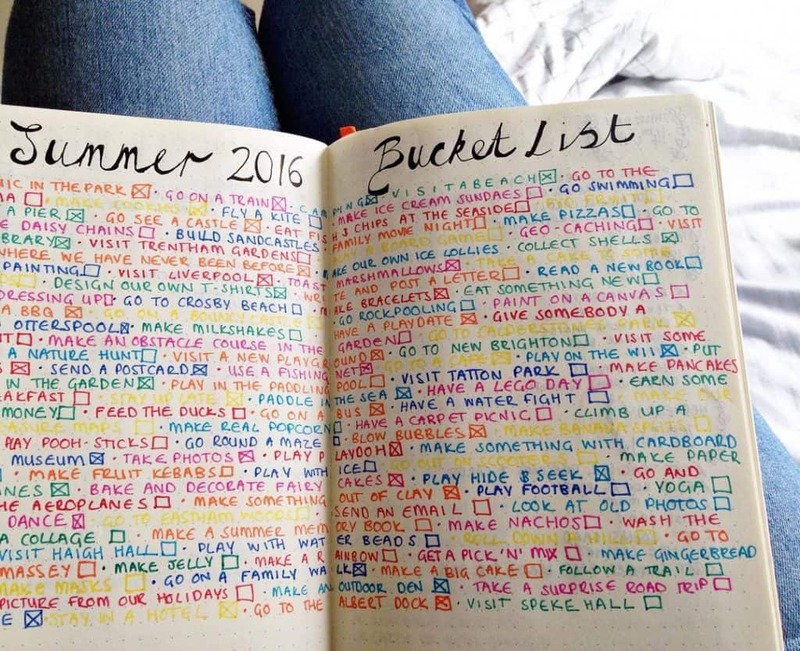 Try a large summer bucket list like this by changing your pen colour with each new item on the list. 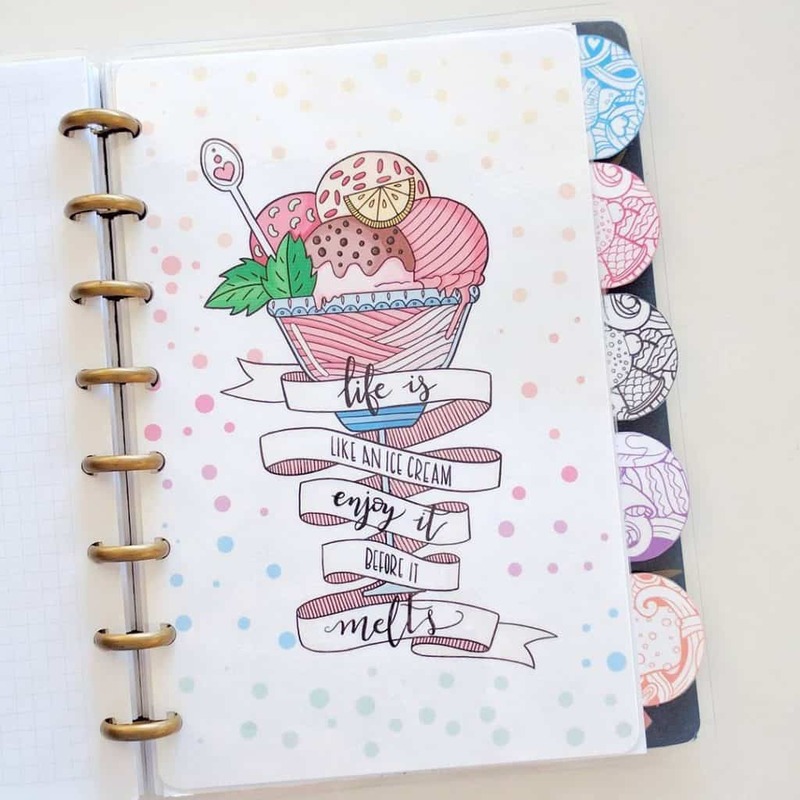 This amazingly bright and colourful spread is by Hayley from @hayleyfromhome. 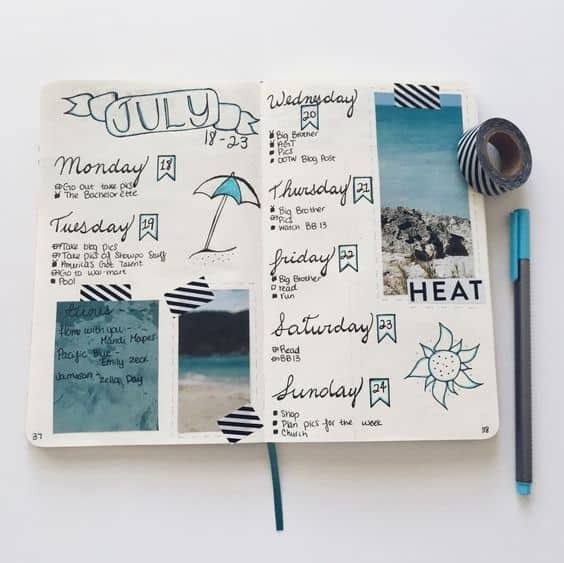 If you have a summer holiday planned, why don’t you plan it out in your bullet journal. 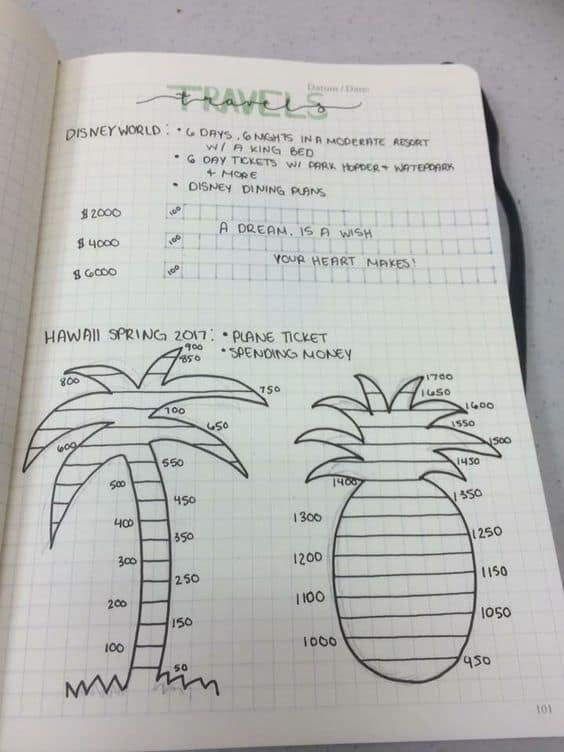 Note down when you fly, any sights you’re planning on seeing or tours you’re planning on doing. If you plan it all out you can be sure to fit in everything you want to do and not forget anything in the process. 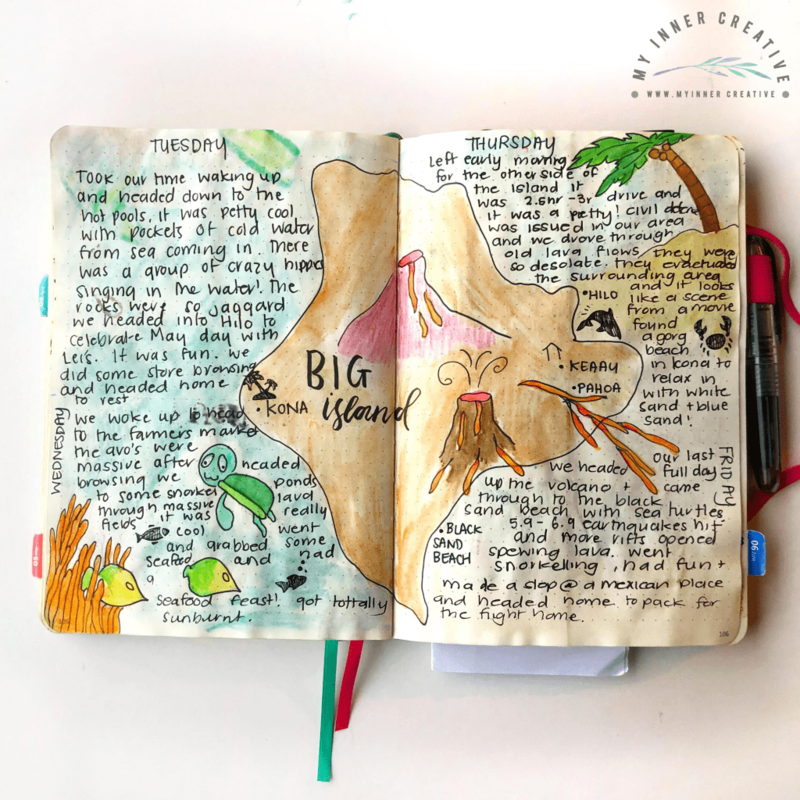 Have a look at how Nicola from myinnercreative.com has planned her holiday to Hawaii. 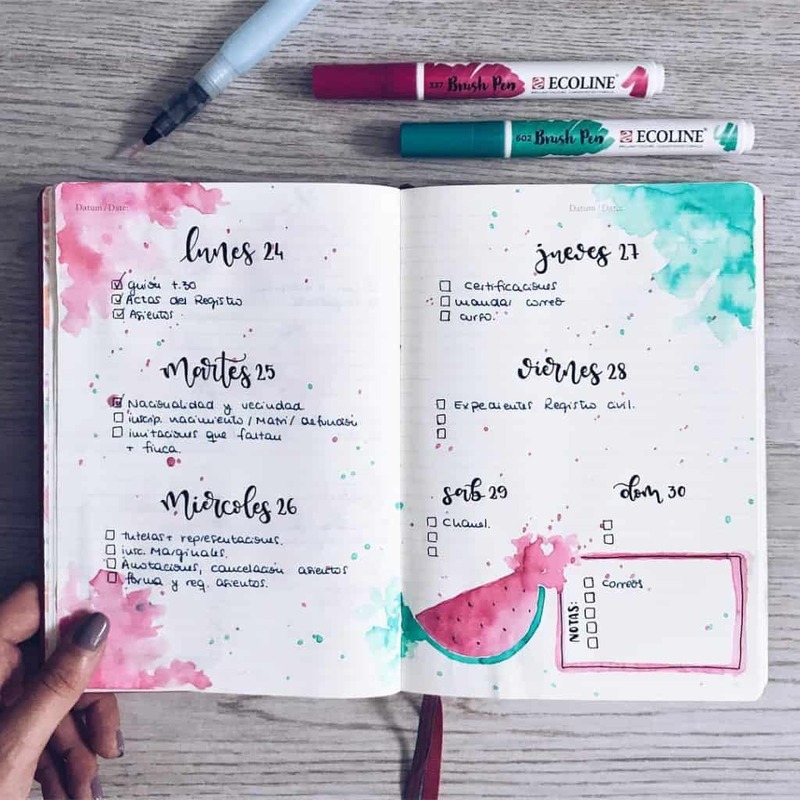 Then while you are on your summer holiday, try journaling in your down time so that all your precious memories are noted down in your bullet journal. 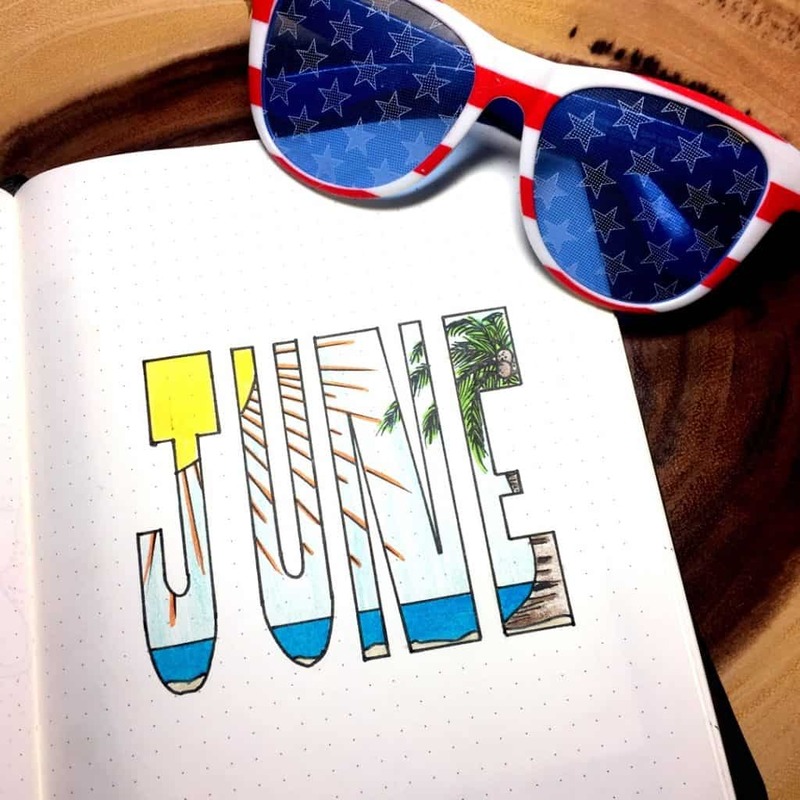 Add some more summer flavour to your bullet journal by adding a summer themed quote to your bullet journal. 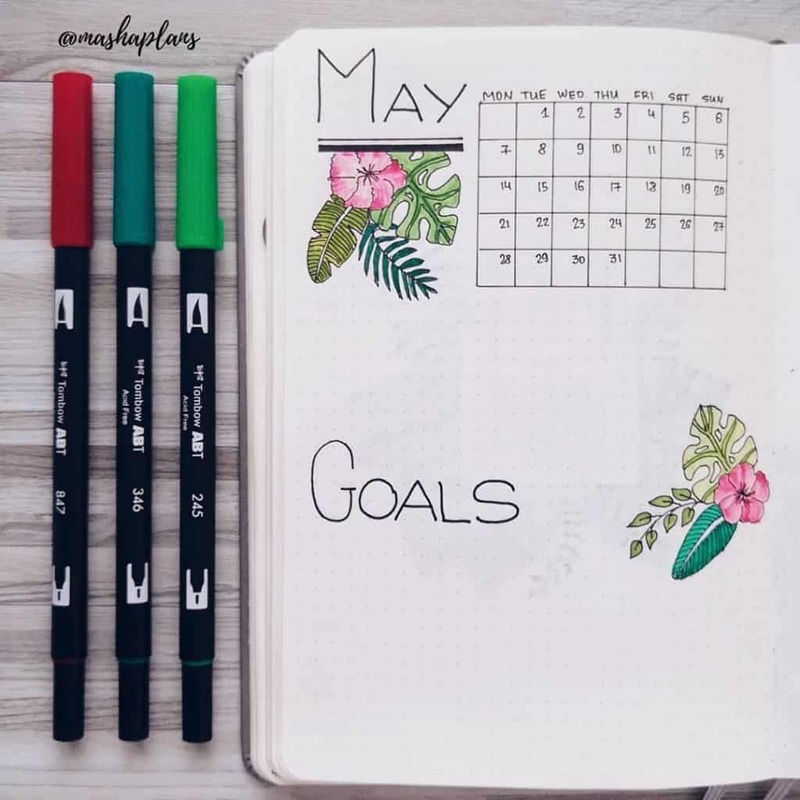 Another one of my favourite bullet journal instagrammers is Nicole from @nicole.journals has added this beautiful quote page to her bullet journal. And look! 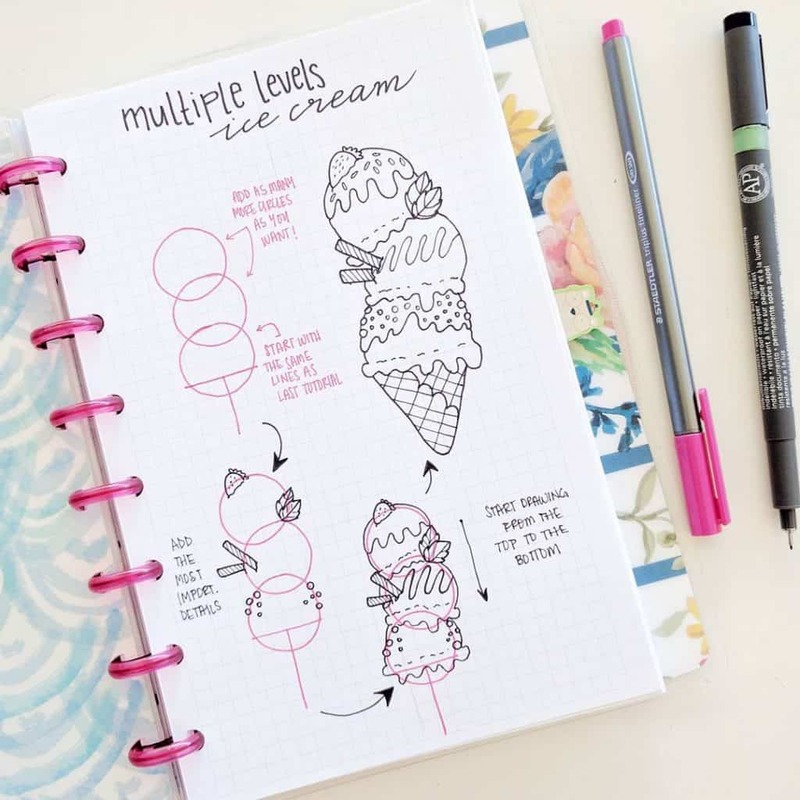 She even has this amazing tutorial on how to draw ice-creams! If you know of any other great summer tutorials, please let me know and I can update this list for everyone!